I have to thank my Mom for putting sewing in my life when I was little. I believe that watching her sew has encouraged me to give it a try. So today I want to share with you her sewing story and show you some of the clothes she made for me as I was growing up. Devo dire grazie alla mamma per avermi avvicinato al cucito da quando ero piccola. Credo che averla vista cucire mi abbia spinto a provare. Per questo voglio raccontarvi la sua esperienza con il cucito e farvi vedere alcuni dei vestiti che mi ha fatto negli anni. For my mom sewing has always been a hobby. She always says she relaxes when she sews. 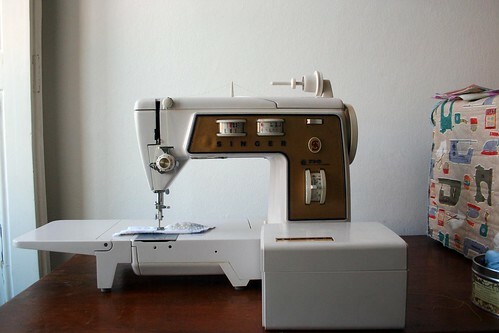 As a child I remember my mom getting the basic house chores done and sometimes getting her Singer sewing machine out of the closet after dinner, setting it up on the dining room table and sewing….of course she had to store everything away before going to bed. Il cucito è sempre stato un hobby per mia mamma. Mi dice sempre che si rilassa quando cuce. Quando ero piccola ricordo che mia mamma la sera dopo aver sbrigato le faccende, tirava fuori la macchina da cucire dall’armadio e si metteva a cucire sul tavolo da pranzo… ovviamente doveva riporre tutto prima di andare a dormire. Often it was simple alterations for the family…you don’t have time for much more with 2 kids, running the house and working, but on occasion the magic came to life and she made clothes for herself and for us. I remember her doing some hand-sewing while watching TV on the sofa (just like I do today!) and her giving me small tasks like taking out all the basting stitches from a garment (now I would love to have someone who did that for me… it can get really boring). Spesso erano semplici modifiche per la famiglia… non hai molto tempo per altro con due figlie, la gestione della casa e il lavoro, ma a volte succedevano miracoli e si metteva a cucire abiti per lei e per la famiglia. Mi ricordo che si sedeva sul divano davanti alla TV per cucire a mano (proprio come faccio io!) e mi dava dei piccoli compiti come togliere i punti di imbastitura su un abito (oggi mi piacerebbe avere che possa farlo per me… a volte è davvero noioso). I also remember how tough my sis and I were on her…we sometimes wanted knit clothes and she kept on saying that she couldn’t do that on her sewing machine…Actually my mom doesn’t really like reading instruction manuals so she only ever used her (now my) machine for basic stitches despite hers being very well equipped for the time. Mi ricordo anche che io e mia sorella eravamo molto esigenti… a volte le chiedevamo abiti di jersey e lei continuava a dirci di non poter cucire quei tessuti con la sua macchina… In realtà mia madre non ama leggere i libretti delle istruzioni quindi usava soltato i punti che conosceva sulla sua (la mia attuale) macchina… anche se quella macchina era piuttosto avanzata per l’epoca. When I say that sewing is a family affair I really mean it, because my mom got her basics from her single auntie who was in charge of sewing and mending for her extended family. Those were the times were you couldn’t buy RTW so easily and my mom had all her clothing made by a tailor/seamstress (mom must have picked-up tricks from her too). As my mom got her first job in the 60s, she saved up some money and got her Singer 720 machine. She told me that was more than a month´s salary. But the machine only ever broke down last year when I was actually sewing a knit top (Should have listened to Mom!) and yet I got it repaired. Quando mamma ha cominciato a lavorare negli anni 60, ha messo da parte i soldi per comprare la sua Singer 720. Mi ha detto che all’epoca le è costata più di un mese di stipendio. Ma la macchina si è rotta solo una volta, l’anno scorso quando provavo a cucire una maglietta di jersey (Avrei dovuto dare ascolto alla mamma) ma l’ho fatta riparare. Mom was mostly using sewing magazine as her source of inspiration…Burda was one of her favorites. I loved flicking through those magazines. As we grew older she eventually took a pattern drafting course…but nowadays she is mainly doing alterations and sewing gifts for friends and family like peg holders, baby carriers and so on. Mamma usava soprattutto le riviste di cucito per i modelli… Burda era tra i suoi preferiti. Da bambina adoravo sfogliare le rivste. Quando siamo cresciute si è iscritta a un corso di taglio e cucito… ma ora continua a fare soprattutto modificiche e a cucire regali per amici e parenti come porta mollette, marsupi, portafedi, ecc. Eventually I also managed to have her teaching me how to use her sewing machine so that I could do basic alterations, sew pillow-cases and basic stuff. And finally in 2003 she got a new sewing machine and handed me hers down. It was really a precious gift for me and I really feel emotionally attached to it. Finalmente sono riuscita a farmi insegnare a usare la macchina da cucire per imparare a fare gli orli, cucire federe e altri semplici lavoretti. Poi nel 2003 mamma ha comprato una nuova macchina da cucire e mi ha dato la sua. E’ stato un regalo davvero incredibile per me e sono davvero affezionata a questa macchina. Nowadays I am trying to motivate her to sew (I know she loves it) by constantly sending her tutorials and ideas…and bookmarked Etsy on her pc so she can get some inspiration. But I have also started sewing for her and getting “project assignments”…it´s my way to do something for her and thank her for all she’s done for me. Thank you Mom for passing the sewing bug on to me. Adesso cerco di motivarla a cucire (so che adora farlo) quindi le invio idee e spiegazioni… e ho aggiunto Etsy tra i suoi favoriti così può trovare delle idee direttamente dal suo computer. Ma ho anche cominciato a cucire qualcosa per lei e mi da perfino dei “compiti”… è il mio modo per ringraziarla di tutto quello che ha fatto per me. Grazie Mamma per aver fatto del cucito la mia passione. Why did you learn how to sew? Has it also been a family affair? Perché avete imparato a cucire? Anche per voi è stato un affare di famiglia? I love that you now have your Mom’s sewing machine – and that you’re trying to get her to sew for herself again. Maybe you could do a matching outfits fmaily sewing challenge together (same fabric/s but different patterns) maybe? It might be fun! 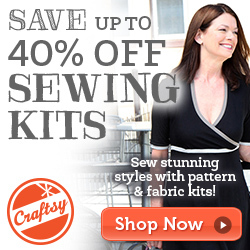 What a lovely post and how great that you have such a great mentor for your sewing pursuits. Sewing does not run in my family where this activity is viewed as “old fashioned”. My day job is pretty unimaginative and I get very little satisfaction from it. I learned to knit first (from a book) and then took a course to learn to sew two years ago. I was looking for something that would give me a creative outlet as well as a tangible result. A finished sewn or knitted object beats the paper pushing I do at work any day! Of course now I’m hooked and can’t imagine not having theses hobbies in my life. You are both so lucky to have each other – please treasure every moment. My mother had a lovely new sewing machine which I was never allowed to use in case I caused it damage. My Father supported my creative sewing and when my Mother went out out of the house he ‘kept watch’ whilst I sat down and used her sewing machine to make my latest creation. Fortunately I studied Dressmaking at school and Teachers allowed me to use all facilities during lunch breaks and after school. These days I have my own sewing studio set up with everything a ‘happy seamstress’ needs and hope to pass my skills on to anyone who wants to learn. Love your mother/daughter story and follow your blog because we travel to Italy from Australia and know all the areas you talk about and love the photos. Regarding pattern weights you were tracking down a few months ago – I bought some coloured alabaster serviette rings at a little shop in Volterra last year and they work really well. I intend getting some more on our next Italy trip! What a lovely story! 🙂 That last picture is so great! What a great legacy! And I like the matching skirts. Amazing, sewing inspiration linked with learning a new language. My great great grandad was from Livorno so here goes!! I love the expression on your mum’s face in the last photo. It looks as though she’s inspecting your handiwork. Does it pass muster?